With an experience of a quarter of a century in the field of hot-dip galvanizing of steel parts, we proudly own one of the most well-equipped hot-dip galvanizing workshops in Iran and the Middle East. + Power plant and refinery equipments and parts. + Power transmission tower parts. + Sundry tubular towers and lightening poles and lamp-posts. + Steel structures used in roads and transportation industry. 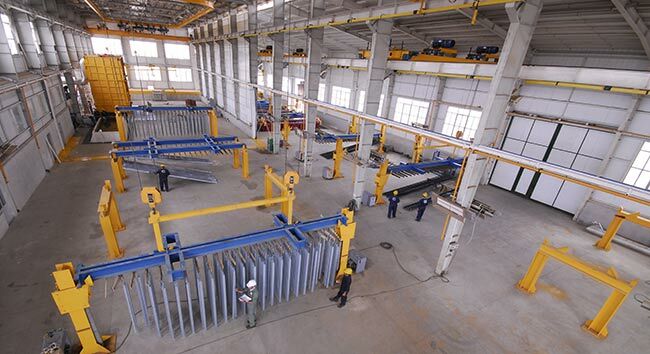 + Steel structures used in construction industry. 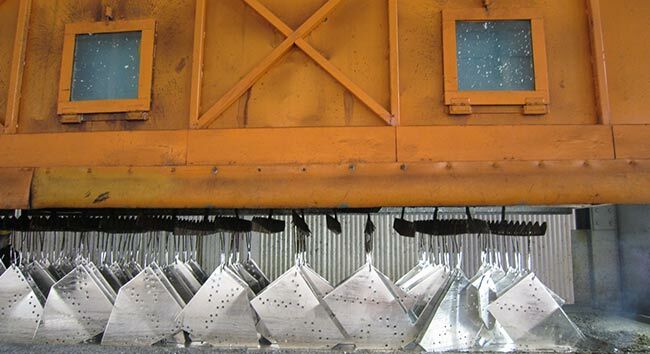 + Overpasses, and Other equipment that require hot dip galvanizing. Establishing a duly equipped laboratory at our plant and checking the Hot-Dip galvanizing process accurately have provided the customers with choices of coating thickness and appearance of the parts they are delivered. Thanks to the numerous pickling baths, customers’ orders are made up within the shortest possible period and with a good quality. It merits mentioning that giving reasonable lead times is one of the parameters on which the company has always placed a high priority. – Lower costs: compared with other common methods of corrosion prevention, a larger number of parts at a lower cost can be coated when hot-dip galvanizing method is applied. – Longer lifetime: the lifetime of zinc-coated equipment and metallic parts used in highly corrosive environments is about 20 to 30 years; and it can even reach 70 years in milder climatic conditions. 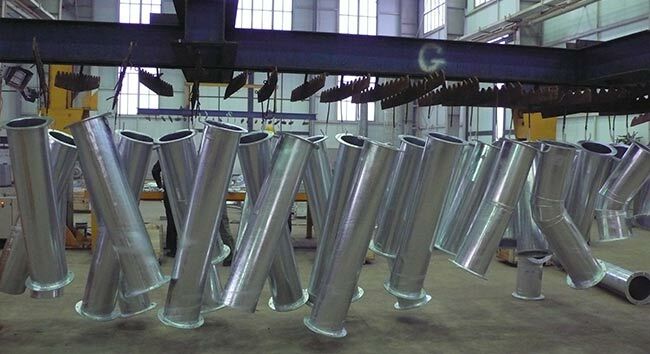 For this reason, that is; the prolonged durability of steel parts coated through application of Hot-Dip galvanizing method, coating steel structures, telecommunication, and power transmission towers, pipes, fittings, and fixtures used in oil and gas industries by this method is becoming increasingly popular. – Durability of coating: the coating applied through galvanizing is highly resistant against mechanical damages, abrasion, and corrosion due to formation of a particular metallurgic structure on the surfaces coated. – Convenient inspection: galvanized coatings can be inspected conveniently without a need to conduct any destructive tests; rather, through visual inspection. Besides, in order to check the compliance of the coating thickness with the internationally accepted standards, simple non-destructive tests using macro-meters have proven feasible. In view of the above, as well as the role of preventing steel corrosion in industrial growth and promotion, it is safe to claim, that Hot-Dip galvanizing is one of the most reliable methods among the ones commonly practiced. Incidentally, our hot-dip galvanization facility, which has had a remarkable record in this area, is proudly ready to galvanize all types of articles – of any shapes and dimensions, required by customers to be galvanized – within the shortest possible time and with the best quality.